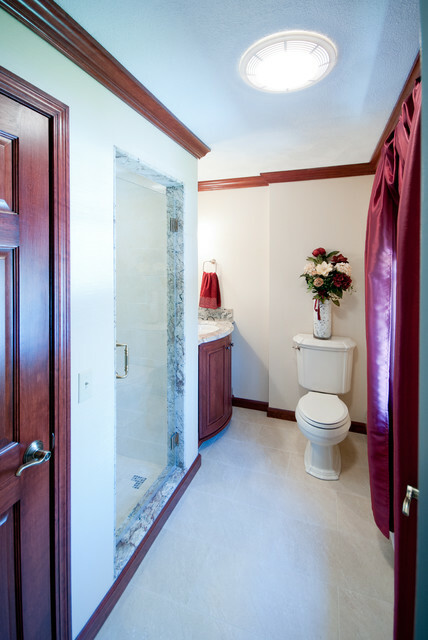 Mitchell Parker added this to Bathroom Workbook: How Much Does a Bathroom Remodel Cost? Reynolds-Poulin did this bathroom for $60,000. The 5- by 8-foot space features wallpaper, stained crown molding, porcelain tile floors, a granite countertop on custom cherry cabinets made by a local carpenter and cherry doors. There’s also a vibrant bronze finish on the plumbing fixtures, some glass accent tiles and a frameless glass door. “It’s simple in nature but has some nice colors to it,” he says.